Hi, I'm so excited to be sharing this project with you today. 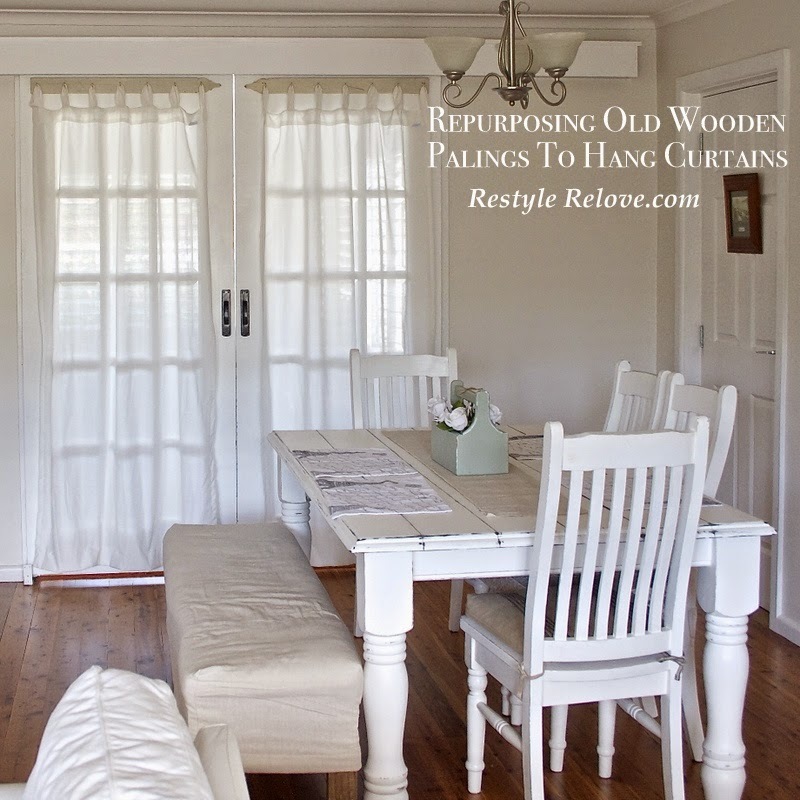 I'm going to show you how I repurposed old wooden gate palings/pickets to hang curtains. 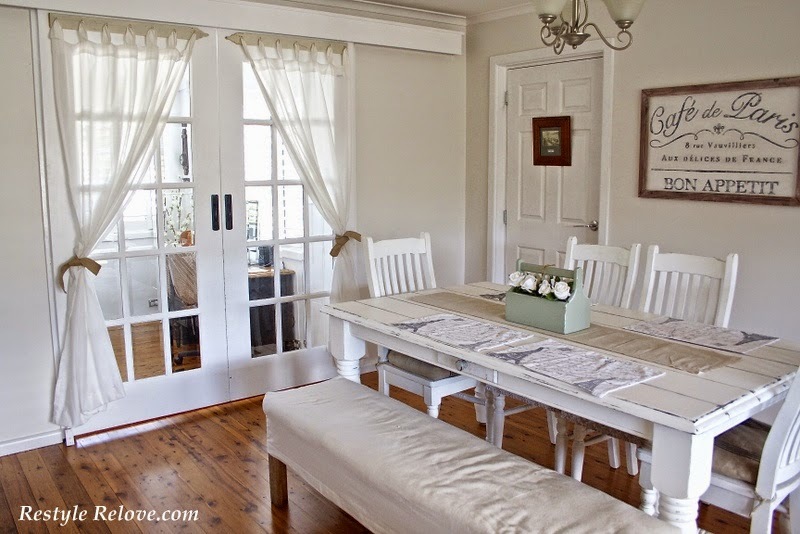 In our dining area we have big double sliding doors that lead out into the sun room / toy room / my office area / the kids homework area / the indoor washing line area / the folding dry clothes area, etc. I never photograph these doors fully as the back room is always a mess. Here is the closest "before" photo I have. And a similar view with the new curtains hung. The back room is still a work in progress, but it was okay enough to take this full on shot with the doors open. For this project, I used some old wooden palings/pickets off an old gate I had, added some gold cup hooks, attached the paling directly to the sliding doors with picture hooks hung on screws, then added my curtains. 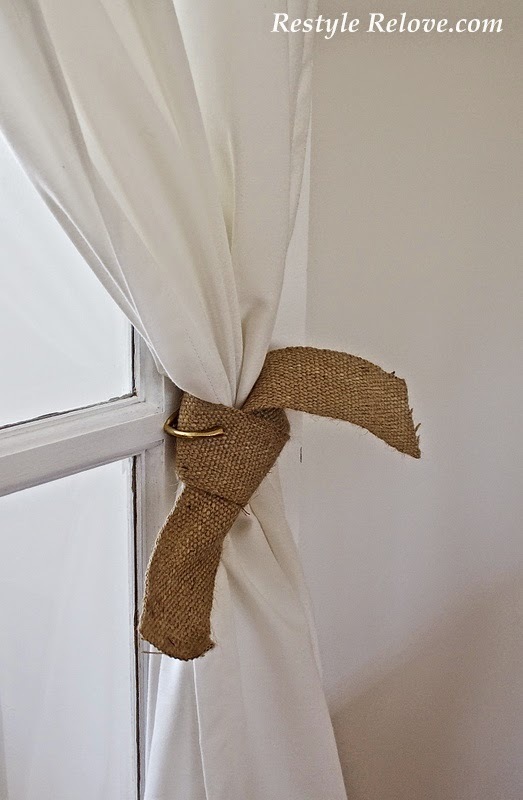 The curtains can be left to hang freely, or tied back with burlap and secured behind a gold hook. On a brighter note, I've included my second video blog tutorial on how I did this project below. I'd love to hear your feedback. I've never heard of a pailing sliding door. Your room looks spectacular! I think the curtains just add to the look in the dining room. They give a soft back drop as well as hiding the messy room. Love them, thanks for sharing them! I love this idea. I didn't know what a paling was. Your dining room looks great. Love your new curtain idea! Very creative! 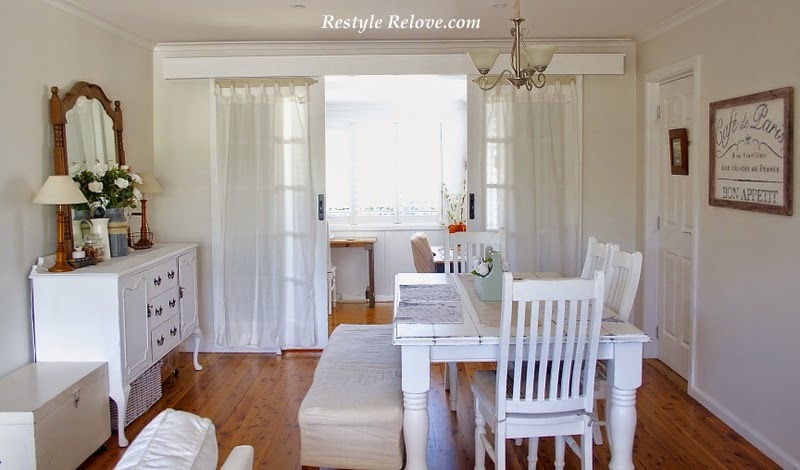 I also love all the soft whites in your dining room! Hope your foot heals soon! What a darling idea!! What a difference it makes and such a simple idea!! Great! I love this idea, great video too. The picket is so much more interesting than a plain curtain rod and they're perfect on your sliding doors. Thanks for sharing at Vintage Inspiration Party. What a wonderful idea...very creative. Thank you for sharing this with us. Very cute! I have some pickets from my grandparents old fence. You have given me a new idea to use them for. Thanks! 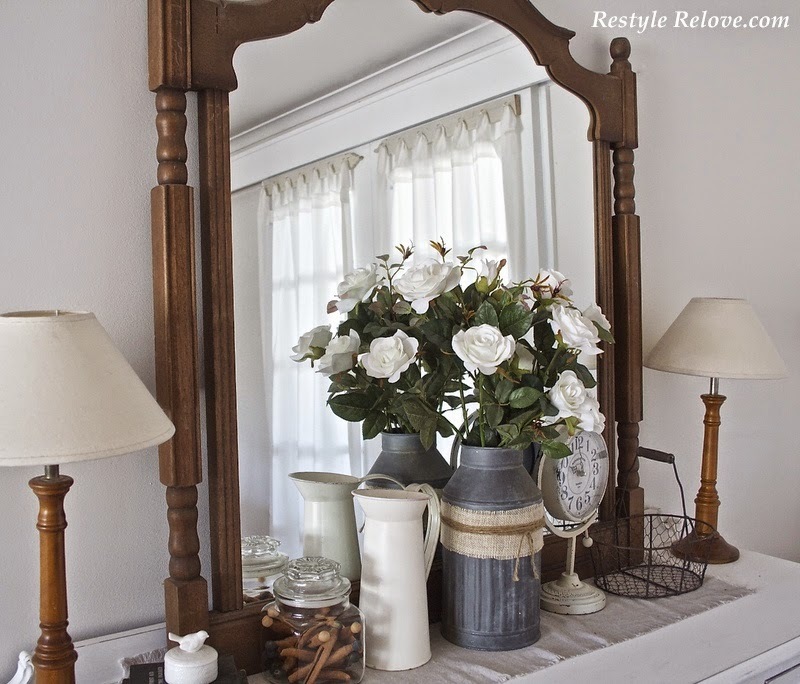 By the way, I love your white farmhouse look! Julie, this is such a great, adorable idea! 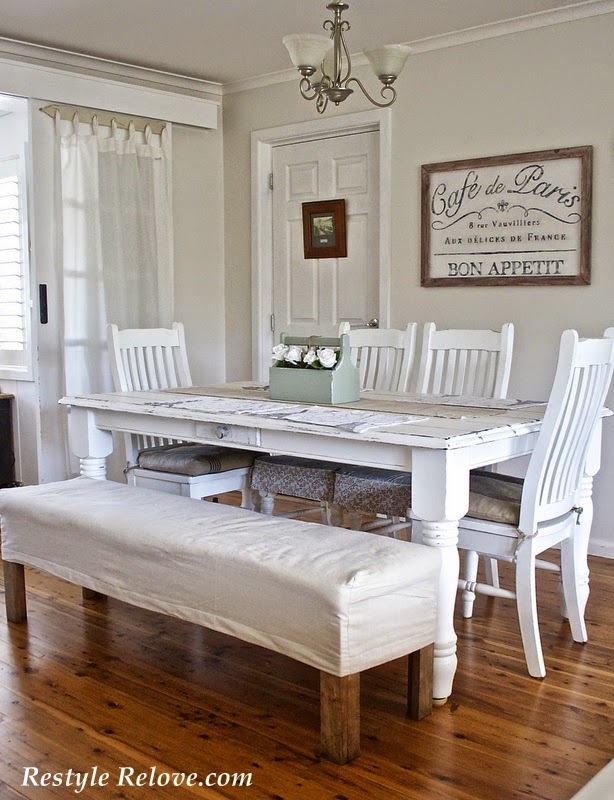 Your room is lovely and that kitchen table is drool worthy! Your space is so pretty! I love all the touches you added. Thanx for sharing at THT!